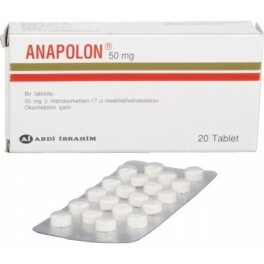 Anapolon (Anadrol) is the common brand name for the active anabolic steroid ingredient Oxymetholone. Oxymetholone is an oral drug with a dosage of 50mg per tablet. Oxymetholone is considered by many to be the most powerful steroid available, with results of this compound being extremely dramatic. A steroid novice experimenting with oxymetholone is likely to gain 20 to 30 pounds of massive bulk, and it can often be accomplished in less than 6 weeks, with only 50-100mg a day. This steroid produces a lot of trouble with water retention, so let there be little doubt that much of this gain is simply bloat. But for the user this is often little consequence, feeling bigger and stronger on Oxymetholone than any steroid they are likely to cross. Although the smooth look that results from water retention is often not attractive, it can aid quite a bit to the level of size and strength gained. The muscle is fuller, will contract better and is provided a level of protection in the form of "lubrication" to the joints as some of this extra water is held into and around connective tissues. This will allow for more elasticity, and will hopefully decrease the chance for injury when lifting heavy. It should be noted however, that on the other hand the very rapid gain in mass might place too much stress on your connective tissues for this to compensate. The tearing of pectoral and biceps tissue is commonly associated with heavy lifting while massing up on heavy androgens. There is such a thing as gaining too fast. Pronounced estrogen trouble also puts the user at risk for developing gynecomastia. Individuals sensitive to the effects of estrogen, or looking to retain a more quality look, will therefore often add Nolvadex to each cycle. It is interesting to note that Anadrol 50 does exhibit some tendency to convert to dihydrotestosterone, although this does not occur via the 5-alpha reductase enzyme (responsible for altering testosterone to form DHT) as it is already a dihydrotestosterone based steroid. Aside from the added c-17 alpha alkylation, oxymetholone differs from DHT only by the addition of a 2-hydroxymethylene group. This grouping can be removed metabolically however, reducing oxymetholone to the potent androgen l7alpha-methyl dihydrotestosterone (mesterolone; methyldihydrotestosterone). There is little doubt that this biotransformation contributes at least at some level to the androgenic nature of this steroid, especially when we note that in its initial state Oxymetholone has a notably low binding affinity for the androgen receptor. The old practice of slowly tapering off your dosage is totally ineffective at raising testosterone levels. Without ancillary drugs, run away cortisol levels will likely strip much of the muscle that was gained during the cycle. If HCG and Clomid/Nolvadex are used properly, the person should be able to maintain a considerable amount of new muscle mass. Before going off, some alternately choose to first switch over to a milder injectable like Deca-Durabolin. This is in an effort to harden up the new mass, and can prove to be an effective practice. Although a drop of weight due to water loss is likely when making the switch, the end result should be the retention of more (quality) muscle mass with a less pronounced crash. Oxymetholone has been reported to produce gynecomastia in users (not all probably around 50%). An anti-estrogen should be used to counteract the aromatization.